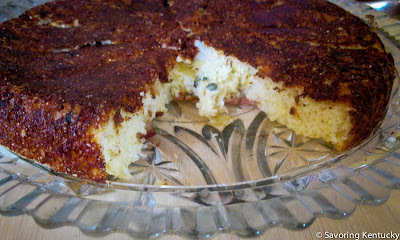 This cornbread, or something like it, remains a favorite of some who come to Cornbread Supper. It's often made by guess, based on what's available, but here's an attempted recipe. And now the frank admission: This cornbread is a lot of work. We could call it "Arduous Cornbread." You have to love it, or serve it to people who love it, to make it worthwhile. For one 12-inch cast iron skillet, or one 9-inch skillet and a smaller 6-inch one as well. Should serve 8 - 14, depending on so many factors. If you think of it and have time, mix the cornmeal and buttermilk together thoroughly in a very large bowl up to 24 hours in advance, and let set at room temperature. Even an hour can help. This “blooms” the meal a little bit, makes the nutrients more accessible, aids with moistness in the final product, and allows the batter to be significantly warmer than if you use buttermilk straight from the refrigerator. Warmer batter cooks more quickly and evenly. But if you don’t have time or don’t remember any of this, the cornbread will still be good. Chop and sauté the onions in olive or other good oil; add hot peppers if you like. Cube or grate the cheeses. After the vegetables are cooked and the heat is turned off, add the corn kernels if you like. When you’re ready to bake, preheat the oven to 375 degrees F. (In a hurry, you can bake this at 400, but it can get fairly brown on the outside while remaining a bit more moist than you’d like inside.) Put the skillet in the oven during preheating. Put the ½ cup neutral oil in the heated skillet, and return the skillet to the oven. If you have “bloomed” your cornmeal, use that bowl for assembling the batter, adding all the ingredients in number 3. If you have not bloomed the cornmeal, in a very large bowl, put these ingredients: cornmeal, buttermilk, cottage cheese or sour cream, eggs, cheeses (except for 2 tablespoons, to be used for topping), sautéed onions, peppers, corn kernels, baking powder, soda, salt, and sorghum. Carefully remove the hot skillet from the oven and pour all but about 1 ½ Tablespoons heated oil onto your batter (sizzle!). Leave enough oil to coat the bottom of the skilled lightly. Give the batter a quick (careful) stir. Bake for about 25 -30 minutes, until thoroughly golden brown. Better to err on the side of over-done than under-done in this case, as more cooking likely adds more crunch, and probably helps keep the very center from being unpleasantly goopy. Remove the skillet from the oven, and run a knife around the outside of the cornbread. If you can tell that the cornbread will slip out of the skillet, you can either use a slender spatula to help guide it face-up onto a platter, or you can (extremely carefully!) put a rack or platter over the cornbread and flip it upside down, OR you can simply serve it from the skillet. If you have leftovers, they keep in the refrigerator for a week, or in the freezer for six months. Leftover pieces of this cornbread become memorable when you slice them open and slowly (and spottily) brown them (for still more crust) in a hot toaster oven or regular oven.